Russia’s president for the first time publicly backs Russia’s Communists in preserving Lenin’s Mausoleum, comparing the Soviet founder’s body to saints’ relics. President Vladimir Putin has called for Communist leader Vladimir Lenin’s body to be preserved in its mausoleum on Red Square, comparing the embalmed body of the founder of the Soviet state to the relics of saints. Putin cited almost word-for-word the present-day leader of Russia’s Communist Party, Gennady Zyuganov, who last August said that “this form of burying [the body of] Lenin complies with Orthodox canons and traditions” and also drew the Kiev Pechersk Lavra example to back up his point. Putin also called for “returning to our historic roots,” lamenting a lack of a common ideology. Echoing the words of Zyuganov again, Putin remarked that the Communist Builder’s Code, a list of Communist moral principles dated 1961, borrowed a great deal from the Bible and the Koran. Putin’s comments come as public support for removing Lenin’s body from the mausoleum is growing, a recent survey by the Public Opinion Fund showed. The number of those supporting the idea of burying Lenin’s body has grown 10 percent over the past six years, reaching 56 percent. 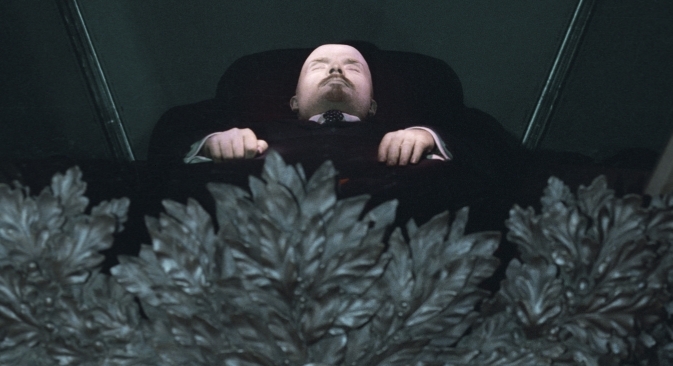 Only 28 percent of respondents said Lenin’s body should be left in the mausoleum. Speaking about the possibility of a Christian-style funeral in 2010 at a meeting of the Valdai club of political thinkers, Putin said that would come “in good time,” Gazeta.ru reported. “The time will come and the Russian people will decide what to do,” Putin was quoted as saying. Dmitry Dyomushkin, leader of Russkiye, a nationalist movement for ethnic Russians, said nationalist and Orthodox activists were outraged at Putin’s remarks. “Putin will undoubtedly lose the support of many Orthodox and Cossack organizations,” Interfax reported Dyomushkin as saying. Lenin’s Mausoleum on Red Square is one of five remaining mausoleums for political leaders in the world. Lenin expressed the wish to be buried near to his parents in Petrograd, but instead Stalin insisted that Lenin be preserved in the mausoleum on Red Square immediately after his death in 1924. Other mummified leaders include North Korean leaders Kim Il-sung and Kim Jong-Il, early 20th century Chinese nationalist leader Sun Yat-sen, Chinese Communist leader Mao Zedong, and Vietnam’s Ho Chi Minh. Calls for the burial of Lenin’s body grew in the late 1980s, during the period of glasnost and perestroika ahead of the collapse of the Soviet Union, and the controversy has raged to the present day. Last year Culture Minister Vladimir Medinsky, a member of the ruling United Russia party, argued for burying Lenin, whom he described as “a highly controversial political figure.” “Having him as a central figure in a necropolis at the heart of our country is sheer nonsense,” Medinsky was quoted by United Russia’s press service as saying.